Put something they really want on the other side, like a yummy, stinky treat. For dogs, the smellier the better, and small pieces of cheese or meat usually does the trick. Be patient and cheerful. Trying to force your pet through – or babying them – is a sure way to enforce any fear of the door. Pets are individuals, just like humans. 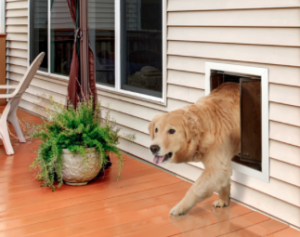 Some cats and dogs will love their new door at first sight, others need a little longer. Keep trying, and remember to give praise – it will help your pet think the door is the best thing ever.